“They weren’t kidding when they said it would be a bumpy ride,” I said as I held onto dear life. The jeep went over a rock and we flew through the air for a few seconds. It was pretty fun. We were at Kualoa Ranch and had decided to do the Jungle Expedition tour. It’s basically what it sounds like: they take you into the jungle. They also warn that it’s extra bumpy. They are not exaggerating when they say this. The jeep stopped and pointed at a pond area. “Is anyone here a fan of the show Lost?” the tour guide asked. My hand shot up. It was like I was in English class all over again. “OH! ME!” I said a little too enthusiastically. I looked around the Jeep that held at least 8 other people. They blinked at me in confusion. The Japanese family muttered something I didn’t understand. (Probably “strange Americans and their flamboyant ways.”) Tom just rolled his eyes. “I’m on it,” Tom said. He raised the camera and snapped away. “And you know this hill,” the tour guide continued. I almost fell out of my seat with anticipation. Did something significant in Lost happen there too? “That was a funny movie!” Tom said and took another picture. We drove on and then stopped again. “This was where a lot of the Lost jungle scenes were filmed,” the tour guide explained. He knows me well. He doesn’t watch Lost but he knows I love the show. We drove on and stopped again at a tall lookout point. Pretty. We also figured out what Shy Grass was. If you touch it, it shrivels up. Sort of like what I would do if Newt Gingrich ever tried to touch me. So the first place they drove us on the movie tour was an old World War 2 bunker. This was used in the movie Pearl Harbor. Still pretty ocean around it. In the bunker they had the submarine from Lost!! We drove around some more. Beautiful ranch area. And it looked like there was a project about to film since we saw white tents dotted around. It’s used a lot in Hollywood. For instance, this was the tree that was used in Jurassic Park. Remember the part where the guy and the two kids were running from the dinosaurs? They hid behind a tree? THIS tree! Remember the part in Lost where they started a golf course? That was here! Do you recall the part in 50 First Dates when Adam Sandler lets a penguin loose to get Drew Barrymore’s attention? That was done here. Did you like the movie Windtalkers? That was filmed here and they left behind some props from the movie. We were shown a few more movie location but nothing I was really interested in. Kualoa Ranch was interesting to look at and I recommend a stop there. You can also go horseback and ATV riding but we opted not to do that. That evening we went to a luau and it was a lot of fun. At the end of the luau a 13 year old kid came and did a fire dance. 13! I kept thinking, “Oh my gosh, please be careful.” Because he was, you know, 13. I kept thinking when did he start playing with fire? How must his parents feel when they watch him twirl a flaming stick? What if he accidentally dropped said flaming stick on his HEAD? I will never (ever, ever, ever) tell Tommy another kids worked fire. That would be no good. I just returned from a trip to Hawaii as well. 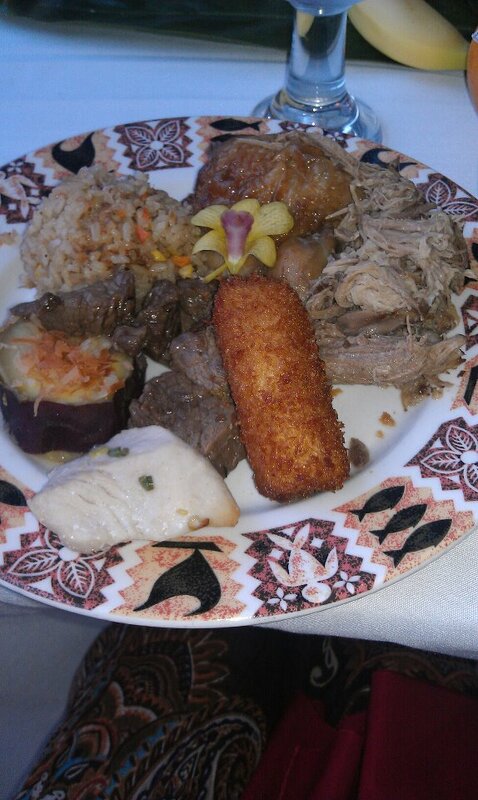 I am quite jealous of your Luau food....looks way better then mine did. I wish I could have gone and visited the Lost sites. I LOVE Lost. I would have been giddy over the "Lost" sites as well. That show was amazing. All of it. wow...pretty cool to see all of those movie sites. Hubs and I went to a Luau too when we were in Oahu! Oh, how I'd love to go back. Wow! Looks like you had a wonderful time! I love that picture of you and Tom. That just looks FUN, FUN, FUN! Great shots! So fun! I never watched Lost, but your enthusiasm sort of makes me feel like I could be missing out on something spectacular...and I don't want. Mmmm . . . kalua pork at a luau. Reminds me of my honeymoon. We had a great time in Hawaii too. Great shot of you and your husband! Looks like an amazing time! I'm jealous - I need to go there.